I want to think about what Saunders is doing with this book as a (sorry) transformative work. (Is it worth mentioning here that my favourite piece of Nesbit fanfic is C.S. Lewis’s The Magician’s Nephew?) There have been other continuations of Nesbit’s Psammead books before–most notably Jacqueline Wilson’s Four Children and It, but the internet informs me that there’s a Helen Cresswell book as well. The Cresswell appears a pretty straightforward sequel–the same sort of thing told over again, but with a new set of Edwardian children. The Wilson is a bit different–the Psammead books exist in this world and one character has read them. While the general children/ adventures/ be-careful-what-you-wish-for theme is inevitable, there’s something being done with the idea of the book itself. The character who most likes to read, and who has read Nesbit, is the one who wishes she could visit Edwardian England–and finds herself in a workhouse. It’s a bit of a kickback against the construction of Edwardian England as a sort of golden age of childhood; one which Nesbit’s books do a lot to construct in themselves. And that construction, that golden England, is connected to WWI as well. It’s all country houses and elaborate afternoon teas and the Empire is strong (I’ll come to that, inevitably) and people dressed like Wodehouse characters and we, with hindsight, know that this awful thing is going to befall these happy, well-dressed people and they’re so young and it’s so tragic. Saunders’s origin story for Five Children on the Western Front is itself a version of this. In the afterword she writes of reading the Psammead books as a child and seeing the Pembertons “as eternal children, frozen for all time in a golden Edwardian summer,” but then, in her teens, learning about WWI for its sixtieth anniversary and connecting the two worlds. Suddenly the golden summer becomes tragic, suddenly there’s all this loss awaiting our characters. But how does this work as a children’s book in 2014 (when it was published in the UK) though? I read the Psammead trilogy when I was quite young because I was the sort of child who would–I don’t know how well known it is even among people of my own generation (a good couple of decades older than the supposed audience for this book). Nor are this book’s hypothetical readers credited with a great deal of background knowledge; witness the clunky, infodumpy scene in which the text explains to us what a VAD is. Does this prior knowledge/lack thereof matter? That adventures and endearing grumpy magical beings are fun, and that war is horrible, are things that any random set of characters could convey–but for this book to work do you need to invoke precisely that sense of a golden past, that protectiveness towards these characters? I think one of the ways the book tries to get round this is with its opening chapter, which is a rewritten version of one in The Story of the Amulet, in which the Pemberton children travel in time to visit “the learned gentleman”/”Jimmy” (“Professor Knight” in Saunders’s version, though I’ve read one review suggesting this is inaccurate) in the near future, where their old nurse is dead, Jimmy is old, and keeps photographs of the now-grown-up Pembertons in his home. [Pause here while I refrain from talking about how great and messy and great the reasoning behind their trip into the future is.] In 1906, when the book is published, this future really is the future; a Wells-inspired utopia (Wells and Nesbit were friends and fellow Fabians, of course). In the 2010s, we know that this is not what the 1930s looked like. Jimmy has pictures, yes, but mostly of the girls–we know that something has happened to the boys. His nostalgia for the past is transmuted into grief–we, but not the children, see him crying when they leave. In the book’s final chapter set some years in the future a grown-up Anthea visits Jimmy and we see that life has moved on, and that most of the Pembertons have happy adult lives, but Jimmy’s grief, his knowledge of what is to come, frames the book, and our experience of it. But is that enough for a reader who doesn’t come to the book already feeling some stake in these young people’s lives? And if it is enough, is that because the book is blatantly manipulative in this respect (and is that necessarily bad)? 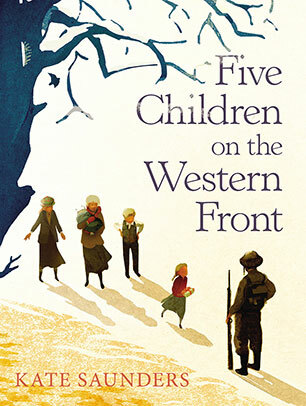 Conveniently, Five Children on the Western Front is also about discovering that a thing that is cute and charming is also kind of evil! 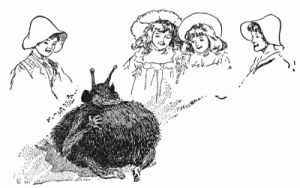 The Psammead, the “sand-fairy” that the Pembertons have befriended, is tubby and furry and cross and has little eyes on horns and is generally adorable–the version above, by (I think) H.R. Millar, is a good one. Impossibly ancient (it remembers the dinosaurs), the Psammead, we learn, has spent at least a part of its life as a vengeful Akkadian god. It is reticent about its activities during this time, and it’s through a combination of coaxing and Jimmy’s expertise (in The Story of the Amulet he was an Egyptologist, but I suppose it was easier to be a genius dilettante a century or so ago) that the children are able to extract some stories. I wondered if Saunders had read Terry Pratchett; there’s a definite feel of Small Gods here. It seems less likely that she’s an Oglaf fan, though from these accounts the Psammead seems to have been a bit more Sithrak-like than one would want. While reading the book I suggested on twitter that thinking of it as an easy allegory about empire might be more fun than reading it as the billionth World War One book of the last few years. Now that I’ve finished I don’t think it works as allegory, but there’s enough there to make a case for something. The empire isn’t particularly present in the book in fact–though Cyril’s favourite book is something titled With Rod and Gun through Bechuanaland and surely Saunders cannot have put that in there innocently. I’m depressingly unsurprised to see no sign that Cyril and Robert’s fellow soldiers might be any colour other than white–I guess the soldiers from the colonies were just deployed elsewhere. However. In a world where a reader might be expected to make connections between the Psammead’s treatment of his subjects and Britain’s treatment of its own (But witness the book’s insistence that its readers might not know what a VAD is; and WWI history, unlike imperial history, is at least taught in British schools) this could make for an interesting reading of the text as embodying an uncomfortable confrontation with the national past–and as I am such a reader, and I like Nesbit, I want that reading to work. Unfortunately, I suspect that discomfort is more present in the original books (you can’t ignore empire in 1902, but if you’re British it’s all too easy in 2016). What we’re left with, then, is the plot in which, at the height of the empire, the barbaric and vengeful (and Eastern) god is taught the values of kindness and compassion by a group of middle-class, white British children; where a creature that has existed since the dawn of time finds its salvation and the whole trajectory of its life bound up in said children. I cried–of course I cried, that was never not going to happen, the whole shape of this book is one intended for crying at–at the end. I don’t know that that’s enough to make it good; in the main, it only made me uncomfortable.